CATHEDRAL CHAPEL was recently renovated with a new altar and a stained-glass window. 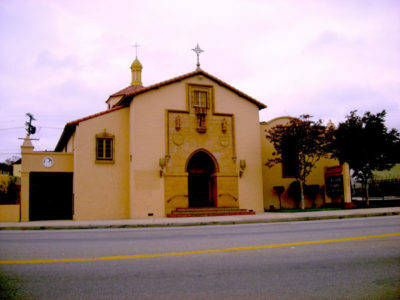 Eighty-five years from the day it was founded, Cathedral Chapel of St. Vibiana marked its 85th anniversary with a dedication of its recently renovated church at 923 S. La Brea Ave. The updated space includes a new altar and baptismal font, upgraded lighting and electrical systems and new flooring. At the Rite of Dedication, Archbishop José Gomez anointed the new altar that was dressed in new linens. In addition to the new altar that matches the building’s architecture, a stained glass window of Christ the King, which had hung in St. Vibiana’s Cathedral before the 1994 earthquake was installed, as well as four original candleholders. In attendance at the dedication were Gary and Beverly Herman, Hancock Park. Parishioners since 1952, they were married at Cathedral Chapel in 1954. Later, sons Gary, Greg and Jeff attended Cathedral Chapel School, where Gary remains president of the school board and a member of the parish finance committee.